At 0847, Engine�s 1 and 5 were dispatched to the area of 133 Brimbal Ave for a report of a motor vehicle accident. Upon arrival, Lieutenant Robert Atherton and his crew on Engine 5 found a motor vehicle accident with one seven year old suffering a non life threatening injury. Due to the minor nature of the call, Lt. Atherton returned the other responding company. While responding to the first motor vehicle accident, Captain Jeff Sirois witnessed a second accident between a passenger vehicle and a motor scooter that resulted in the driver on the scooter being thrown from his bike, landing in the roadway. Captain Sirois summoned Engine 1 to the scene and quickly assessed the scooter operator for injuries. Although the scooter operator was thrown, he refused medical treatment at the scene when speaking with Emergency Medical Technicians from Northeast Regional Ambulance and firefighters. Beverly Police responded to the scenes of both accidents which were within a quarter mile of one another. The child involved in the first accident was transported to the hospital by Northeast Regional Ambulance. All personnel were clear of both accident scenes by 0917. 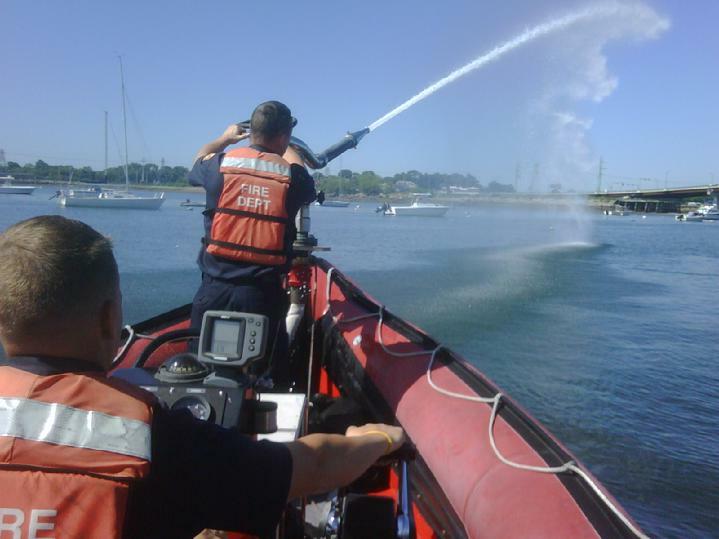 Beverly Firefighters could be found on the water this week training with their fire boat. The boat is used for all types of water related emergecies. Equipped with a 250 gallon per minute pums, the boat can be on scene to fight boat fires or protect exposed boats from a fire. The boat has most recently seen action as a rescue platform for a person who fell from the Beverly Salem Bridge. Beverly Firefighters responded for a report of smoke in the house at 5 Hillside Ave. On scene. Deputy Chief paul Cotter found a light smoke condition and odor of burning throughout the first floor of the home. After a brief investigation, Lieutenant Paul Rideout and Firefighter Jon Palm found a malfunctioning refrigerator and unplugged it. The refrigerator was seen shooting arcs and flames when firefighterrs removed a service panel from the rear of the fridge. The homeowner was advised to have the unit repaired or replaced. Shortly after 11 pm, Engine 5 and Deputy Chief William Petrosino were dispacthed to the Long Hill Reservation on Essex St. to assist police officers who had located a lost hiker with a friend her dogs. The hiker had been lost in the woods for approximately five hours when the oldest of her dogs suffered a minor injury but couldn't walk. Firefighters worked with police to find the safest trail out of the woods and then carried the large dog out in a blanket.